I just want to know what they have planned for my birthday. 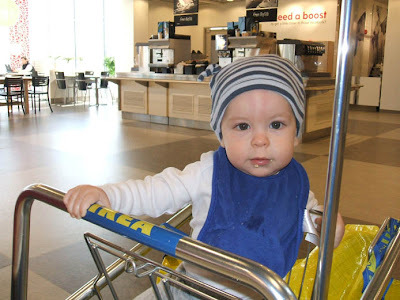 So we gathered up car seats, diaper bags and our good boy and off we headed to IKEA, the Mecca of household décor with the intentions of shopping until the store closed and forced us to vacate the premises. We had such big dreams. We arrived shortly after ten in the morning and by twelve-thirty, if you listen to Felicia tell the story; a crack team of paramedics resuscitated me in the kitchen wares department and helped me back to our car on a stretcher. Two and a half hours. One of the worst shopping records we’ve ever posted. It was humiliating. We were going to have such a fine anniversary dinner at Johnny Carino’s. We were going to dine upon the choicest of Italian delicacies and celebrate yet once again the mysteries of the universe that brought us together four years ago and have kept us together until this very day. Instead we wound up driving straight back home where Felicia fixed her two sick men turkey sandwiches and vegetable soup. We tried to take a nap afterwards but Micah was not in the mood for sleeping. Well, there was simply nothing else to do but rally ourselves as best we could and make our way to our favorite Target department store and spent some of the unexpected windfall of cash we’d been blessed with by Felicia’s father. I bought a Sony surround sound system for the game room and Felicia bought Easter baskets for her boys, acute yellow duck for Micah and the coolest Green snake one for me. Afterwards we went to a favorite steak house of ours and had a pretty good dinner. I enjoyed a petite steak with a lobster tail, Felicia had a Portabella and steak thing and we shared an appetizer of firecracker wraps. Micah enjoyed sampling a little bit of everything. Did I mention that Felicia and I both nailed the gift thing? It was the cherry on top of a perfect day. Perfect day you ask? Yes, in spite of everything we had planned going awry and our trip to IKEA being ruined by the viral bug of doom. It was perfect because it was a celebration of what marriage is all about, better or worse, through sickness and health until death do us part. In the end it was simply doing what it is we do together on a daily basis that made this day as special as every day we share. It was perfect because at day's end we were all together in our little home with the animals curled up at feet enjoying the warmth and joy that only comes from spending time in the company of the loved ones who give such special meaning to the word, family. Thanks honey, and you too, Micah. DirkStar, Thursday, March 20, 2008 10 Tie-Dyed Hippies. Did you say, join me on the poop deck? Four years ago the winds of fate turned to my favor and Felicia came sailing into my life like a gentle and loving breeze. Since the very first day of our journey together across the sea of life our love has been carried into any number of new and exotic ports and harbors by the currents of destiny. Some of the places we’ve visited have warmed our souls like a tropical sunrise on a quiet pacific ocean. We have weathered storms and survived sudden swells of adversity that nearly threatened to overwhelm our tiny boat and send us sinking to the bottom of the waters of adversity where a muddy graveyard of broken relationships awaited us. We have been mariners set upon an odyssey of discovery by a guiding hand whose purpose we may never fully understand. 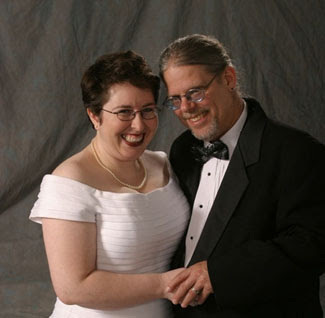 She is my first mate and she keeps me on course and safely guides me through the shoals and eddies of my daily life. Felicia is the sextant by which I plot my course by the stars through the night and the moral compass that guides me to the safest of harbors. Without her I would be adrift and alone. I’ve said it before and I’ll say it again, she is more of a treasure than this old salt deserves. What did I ever do to be so blessed? Four years ago the sun came up over the horizon of my loneliness and a stillness came to the waters of my soul that I’ve never known before. Felicia cleanses the salty brine from my pirate’s soul on a daily basis and brings me closer to the divine hand that has quietly stayed my course throughout my adventurous and buccaneer life. With the help of Felicia’s loving tenderness I have come to look forward to the day I visit my final port of call with a sense of peace and dignity. Someday when I stand before the great harbor master and I am asked what I have to show for my journey I shall turn and point to the two treasures that in the end have made my life worthwhile and of value, my lovely wife Felicia and Micah our wonderful son. They are more than I could ever have hoped for and the greatest gifts I could ever wish to share with the almighty. And thank you for putting up with this Black Beard of a soul. You and your endless love are making me a much better man than I ever believed I could or would be. DirkStar, Sunday, March 16, 2008 14 Tie-Dyed Hippies.